Chain Link sudoku is another of the many interesting variants on the standard sudoku puzzle. The majority of sudoku fans will be familiar with the jigsaw or irregular sudoku puzzle whereby the regular shaped box regions are replaced with all sorts of shaped regions that slot together and make very interesting solving logic. Another variant based on jigsaw sudoku is called chain link sudoku, as seen in the sample image to the right. 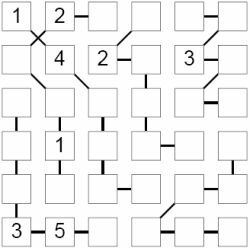 The difference between jigsaw and chain link sudoku is that the cells in the regions need not touch horizontally or vertically in chain link sudoku, allowing an even larger set of possible region shapes, and this too adds intriguing solving logic. Thick lines between each of the cells in a region are to be followed in order to see which cells are in each region; in the example above there are 6 regions each containing 6 cells, since it is a 6x6 puzzle (note that these puzzles can be provided in a range of different sizes and difficulty levels). As with ordinary sudoku, 1 - 6 (or smaller/larger depending on the puzzle dimensions) must be placed once in each row and column.